This collection of free fashion doll sewing patterns has the perfect all season coat included. This cute little pattern can be used to make a coat for fall, winter or spring or all three seasons. The coat has long sleeve with turn up cuffs. You could use matching fabric or contrasting. Adding the two front pockets and sewing some decorative stitching along the front panels will complete this in a very fashionable way. Using different fabrics will determine the season. Corduroy or wool are perfect for a thick winter coat. You can use gray or black felt that would give the appearance of wool. Using flannel would make up a nice fall coat. Spring brings bright colors and lighter fabrics. This pattern could be made up to be a nice light and colorful cover up to complete an outfit. And remember you could always shorten the pattern, leave off the cuffs and pockets and you will have a nice little jacket. 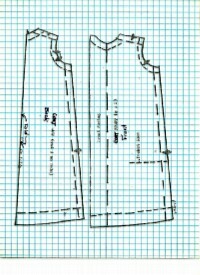 Lay out pattern on fabric. Coat back should be placed on the fabric fold. Coat front should have 2 cut. Cut 2 sleeves, cuffs, and pockets. Cut 1 collar. 7 – Turn under and than blind stitch to inside of coat. Draw off pattern to scale 1 square = 1/4 inch. 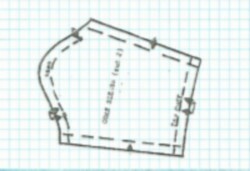 Or you could buy the ebook and just print the pattern pieces off. 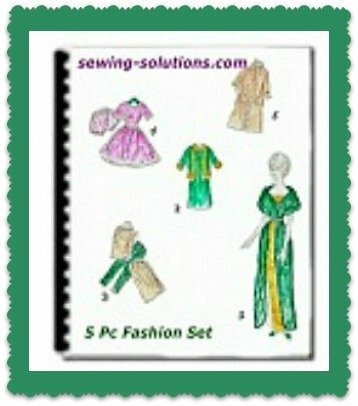 You will find the rest of the free fashion doll sewing patterns in this set online. Also if you don't want to draw them out you can buy the complete set of these patterns. The patterns you purchased are completely printable doll clothes patterns, no drawing needed. The complete set of five outfits is only $2.99 and you will get them immediately upon payment. If you would prefer to have the complete set without drawing and just be able to print them off you will find that available here. This is offered for your convenience at only $2.99 in a (pdf) file with immediate download.